Jury selection began Monday in San Diego in a multi-billion dollar patent trial between Qualcomm and Apple. Apple is seeking $27 billion in damages in the federal lawsuit over modem chips that link iPhone or Apple Watch devices to wireless data networks. Apple accuses Qualcomm of engaging in illegal patent licensing practices; for it's part, Qualcomm claims Apple and its business partners have wrongly stopped paying royalties due Qualcomm, CNBC has reported. Qualcomm is seeking up to $15 billion in damages at trial..
Qualcomm chief executive Steve Mollenkopf and Apple CEO Time Cook are expected to testify at the trial, which could last a month or more. Qualcomm founder Irwin Jacobs might also take the stand, along with other tech-industry heavyweights. SDSU Business School lecturer Steven Osinksi called the legal fight "A battle of the giants. It's really a battle of the titans." 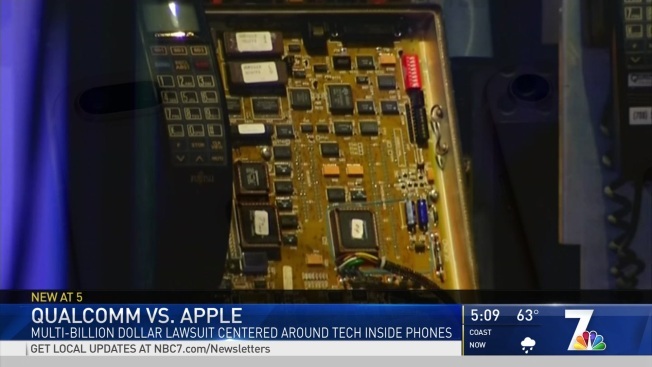 Osinski told NBC 7 it's doubtful that any verdict will translate into lower costs for retail purchases of wireless products. Osinski also said consumers would benefit most if Qualcomm, Apple and other tech-industry giants could settle their legal disputes without trials. "If companies could avoid the litigation and focus on making better products faster, cheaper and most cost-efficient for the public, everybody would win," Osinski said. The federal courtroom was packed Monday with prospective jurors and observers. Judge Gonzalo Curiel has reserved ten seats for media covering the trial.